In European countries trials bikes are the norm and more often than not, off-road riders there begin their riding careers learning balance and throttle control at slow speeds on trials bikes. In America, quite the opposite is true. Here, it’s not unusual to come across a dirt bike rider who has never ridden a trials bike in his/her life or don’t even know what a trials bike is! Instead, they think it’s a trail bike spelled wrong. The Gas Gas Contact 250 is a great bike to get started in trials. The Spanish manufacturer Gas Gas knows this, and they know that not everyone with a curiosity for trials riding needs a top-of-the-line, high-dollar, pro-level trials bike. Enter the Gas Gas Contact 250—a completely capable trials bike with the added convenience of a removable seat and a larger gas tank, perfect for the trials newbie, or for those who simply want a seat for covering longer distances, or for just having something to sit on while chatting with their riding buddies in between tackling obstacles. The Contact offers a blend of trials, comfort and fun. Make no mistake about it, though; the Contact 250 is a true trials bike. It isn’t a hybrid, like the KTM Freeride or the Beta Xtrainer. It’s trials all the way. A chromoly-steel chassis houses Gas Gas’-made 247cc water-cooled two-stroke engine, drinking through a 26mm Dellorto carburetor and delivering power to the rear wheel via a six-speed gearbox. The exhaust pipe and muffler are made out of stainless steel. Suspension duties are entrusted to Spanish-made Olle suspension components. 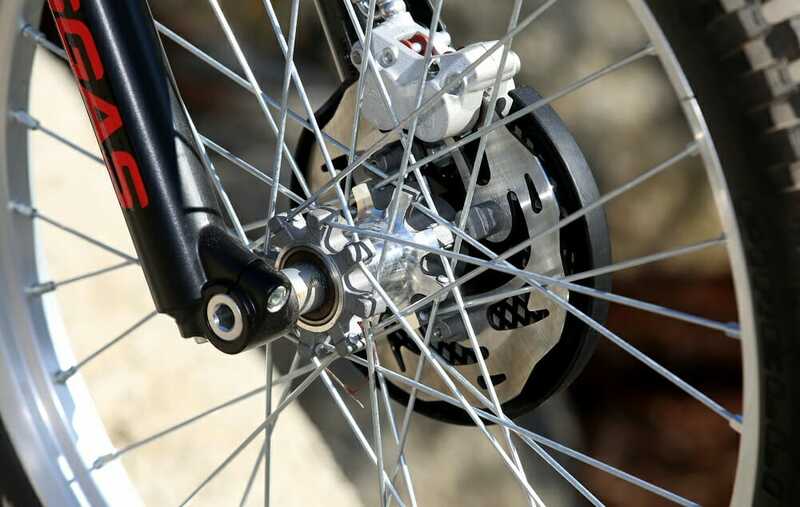 There is a single shock out back and a non-adjustable 40mm non-inverted fork up front. 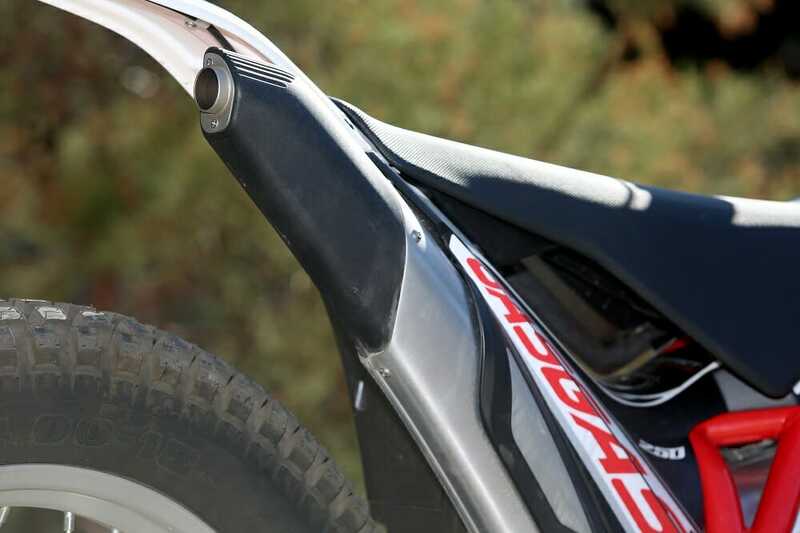 (The rear shock offers spring preload adjustability.) There is approximately 6.5 inches of travel at both ends. The Contact 250 is fitted with sticky Pirelli tires. But what make the Contact 250 unique is that it has what typical trials bikes don’t have—a removable seat and a bigger gas tank. Cool stuff. 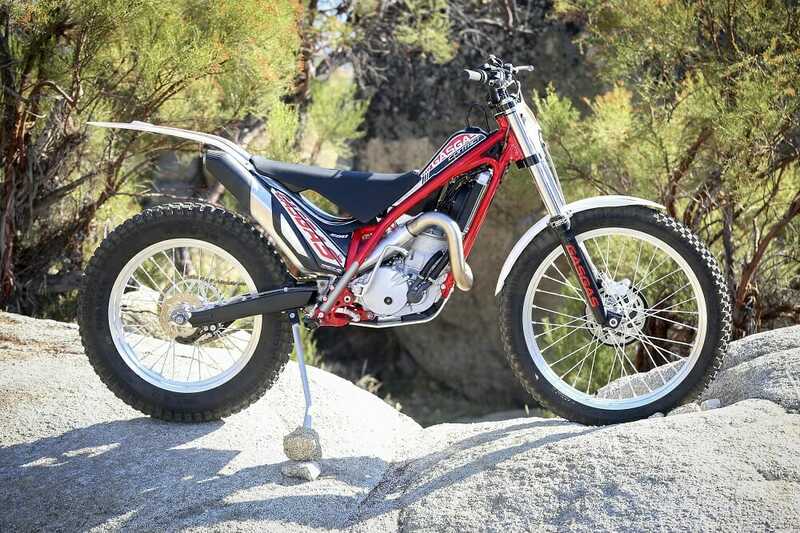 Compared to Gas Gas’ top-of-the-line TXT Replica Factory trials bike that holds 0.5 gallons, the Compact, holds 0.8 gallons. It’s not a huge difference on paper but it does make a difference on the trail. 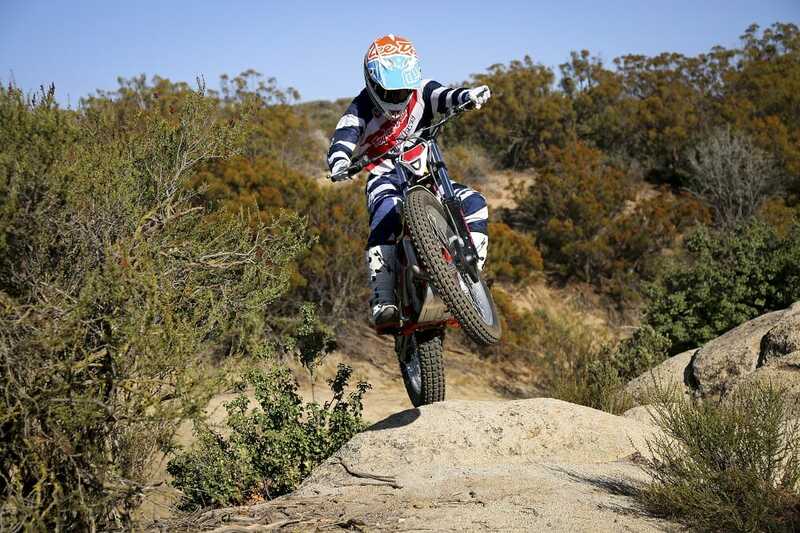 The Spanish manufacturer specializes in trials bikes. They’ve been around a long time. But don’t think for a moment that just because it comes with a seat and bigger tank that the Contact is not serious trials bike—oh, but it is! 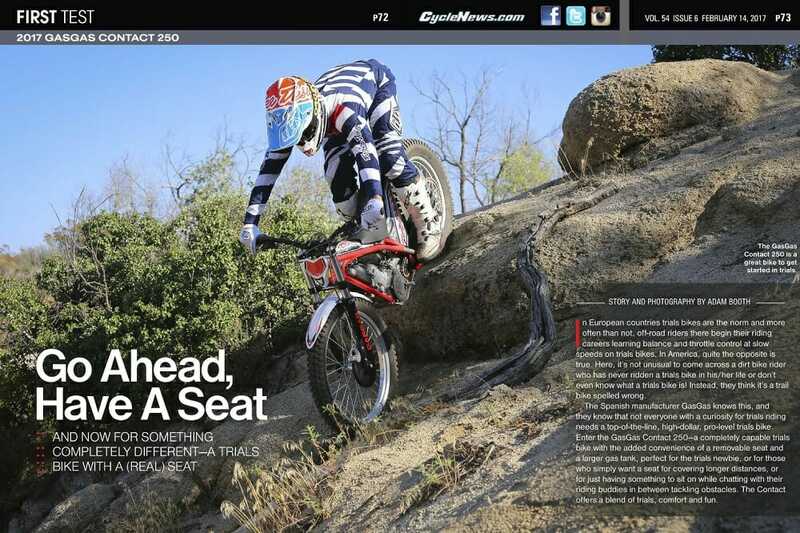 It is fully capable of competing in local trials events with the seat installed or not, and, perhaps best of all, the Contact is less expensive—by about a grand or so—than a higher-end pro-level trials bikes, and it performs nearly as well, and is more versatile. 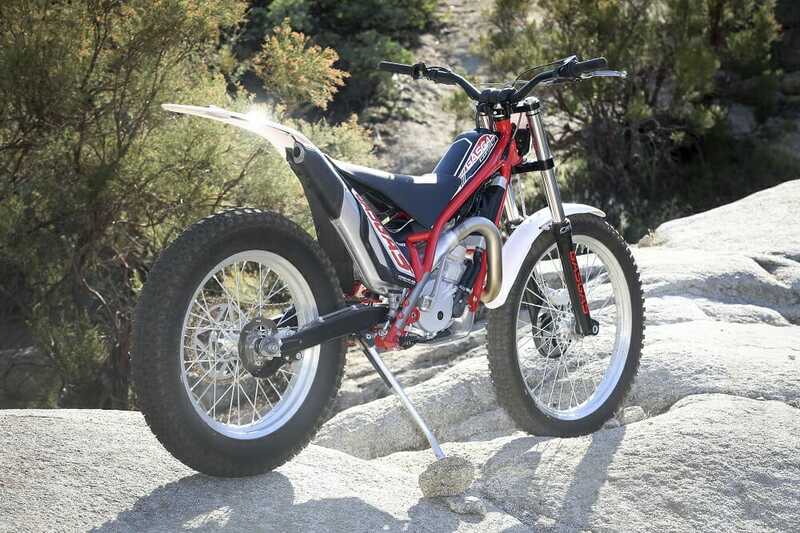 The closest comparable motorcycle to the Contact 250 is probably Beta’s EVO 250 Sport two-stroke, a bike the Italian company says is designed for slow trail riding. Like the Contact, the EVO 250 is based on the company’s higher-end trials bike (EVO Trial) and has a seat and more fuel capacity. 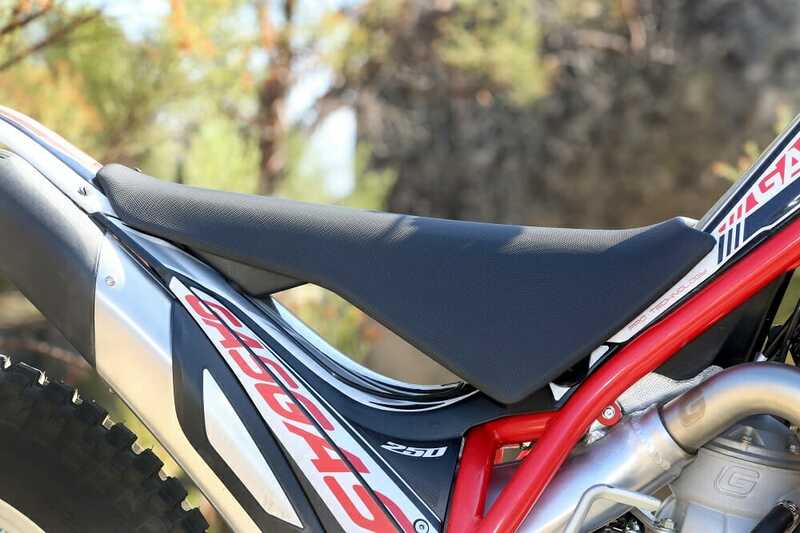 The easily removable seat gives the Contact a bit more versatility. For this test, we hooked up with Gas Gas’ own Geoff Aaron, a 10-time AMA National Trials Champion, and spent the day trials riding, rock crawling and exploring the hills on the Contact 250. Our experience with trials is purely for fun, and while the Cycle News staff dabbles in riding trials, none of us considers ourselves experts by any means in the genre, making us the perfect candidate for the Contact. The Contact 250 might be designed for entry-level trials riders but it’s very capable in the hands of experienced riders, too. It’s Geoff Aaron! CN’s Jesse Zeigler wasn’t worried (at least he didn’t show it). But for casual riding, the Contact is a breeze to operate. The power out of the 250cc engine is ultra smooth and impossible to stall; the brakes work amazing and the clutch pull has almost zero resistance, yet still offers good feel, a must for slow-going trials riding. And the Contact is extremely light and easy to throw around. Claimed dry weight is a paltry 153.2 pounds! In comparison, a KTM 250 XC two-stroke off-road bike weighs 220 pounds, and that is considered really light for an off-road bike. Very few decibels come out of here. After a few hours of bopping round the hills and rocks, we improved noticeably (wasn’t hard when we started at near zero trials-riding skill), our confidence grew and we began conquering bigger climbs and trying more technical lines. Then Geoff would hop on and remind us what a trials bike can really do! Talk about an ego check!